The pontiff took questions for an hour and 20 minutes at a no-holds barred press conference, something no Pope has done in years. NBC’s Anne Thompson reports. >>> to the journalists sitting in the back of his plane flying him back to the vatican from rio, the pope's words today during a surprise airborne news conference seemed if not revolutionary certainly newsworthy and historic in terms of the catholic church . among those journalists on the plane, niece's anne thompson . >> reporter: from the mass attended by more than 3 million on copacabana beach to more personal encounters, spectacular images marked pope francis ' trip to brazil, but one of the most dramatic moments came on the flight home. >> i'm going to face that. >> reporter: a no holds barred press conference, something no pope has done in years. animated, relaxed and funny. the 76-year-old pontiff took questions for an hour and 20 minutes . asked about the so-called gay lobby inside the vatican , the pope gave an answer no one expected. if a person is gay and seeks the lord and has goodwill, who am i to judge that person? >> it sent a strong message from the head of the catholic church that gay people should not be marginalized, should not be discriminated against, should be -- he wants to be inclusive and welcoming to them. 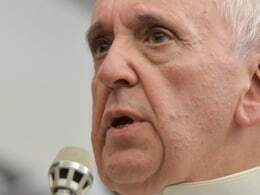 >> reporter: francis said no on women priests , explaining the church had spoken on that. as for his predecessor and neighbor at the vatican , pope benedict , francis likened him to a wise grandfather. he says he doesn't live in the papal apartments because they are just too big. he says he cannot live alone for psychological reasons. francis likes to have people around him. that's why he liked having less security around him so he can meet people. he knows there could be a crazy person in the crowd but says there's also the lure. asked what's in his black briefcase, the pope joked it's not the keys to the atomic bomb , just a razor and some books. the pope with a common touch, showing compassion today with his actions and words. anne thompson , nbc news, vatican city .